A couple of weeks ago, we were given a bouquet of Yarrow at the Farmer's Market from some of our farmer friends. I *believed* that yarrow was a flower that was used for many different things, one being a natural dye. Through the magic of google and a nifty phone, my farmer friend was able to confirm I was correct as well as share with me the other many useful reasons for growing this flower around your home! A very kind reader just informed me that a book she is reading, Growing 101 Herbs That Heal, by Tammi Hartung says only use the white yarrow medicinally and use the colored yarrows for dye. Thank you again, Mommy Set Free for your information! Aromatherapy and essential oil uses are for gynecological problems, for congestion, migraines, open sores, circulation.... and so on!!! I do believe that if we were to take the time to look, get our bodies back in with nature by eating what is real food, drinking what is real and stay away from man made pills (if possible) then God has provided us with SOOOO many ways to use His world around us. Everything has a purpose. As you know I wanted the yarrow for dye, but before I made it up, Shannon started feeling poorly. Headache, chills, and the works. I gave him two of the yarrow leaves. He put them in his nose for a little while and within no time his headache went away. It was amazing. Now don't be all grossed out, I mean, really. 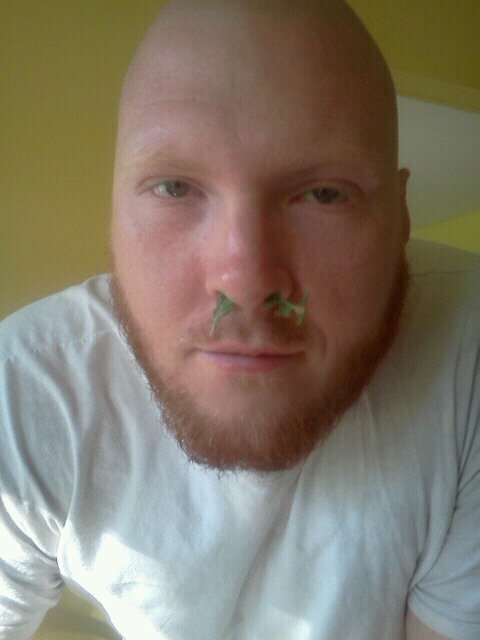 A couple of leaves in the nose is no big thing... He could have taken tylenol or advil or something, but why??? Why take something that does more damage than good? Now, on with the dye. Yep, you get the real deal on this blog. I had the flowers all cut up and so lovely, but I got in a hurry and forgot a primary ingredient to help make the dye. I was supposed to soak my wool in a plant fixitave before I put it in my dye pot. And hopefully you can remember this step if you are to try making the dye. And if you are interested in growing this herb on your homestead, as we are.... a friend of ours said that it takes over. So growing it in an area where it has plenty of room to spread is a must. It can grow in full sun. It doesn't take great soil. It can come in many colors! If you grow this and have any other information, please let me know. I would love to hear from you! 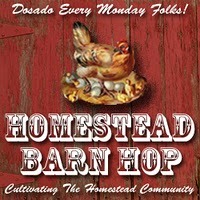 May you have a wonderful day on your homestead! I have yellow, pink and white yarrow growing. So if yellow gives yellow dye? then will pink give a pink dye? Colored yarrow is fine for dies and beautiful to look at but the white is the only one that should used medicinally. (I am sure the two up the nose caused no harm!) :-) Please please double check that for the safety (or at least effective treatment) of your family and your readers. If you choose to experiment in that way. I did do quite a bit of research on the matter and didn't find any that specified that ONLY white should be used medicinally. I will look further, thank you for your information. I happened to be reading growing 101 Herbs That Heal, by Tammi Hartung (It was literally open on my lap hen I popped up your post.) I had identified Yarrow earlier that day and was planning to go back for it the next morning. I just wanted to see if their were any tips on harvesting it. (Sometimes it is best to do it in the early morning -things like that for medicinal uses, etc.) On page 153, It states, " Although some varieties of Yarrow have yellow flowers, these should not be used medicinally." You know the internet, there is oftentimes SO much out there it can become overkill. I will amend my post. Thanks again. Way cool. I love yarrow just because it is native (CA) and attracts the pollinators. I had no idea that it had so many other uses. I just may plant some more! The most recent edition - http://laurawilliamsmusings.blogspot.com/2012/06/carnival-of-home-preserving-13-come.html - open until Thursday 6/7.